Name: 4-Jaguar. Ruled by Tezcatlipoca, inhabited by giants, devoured by jaguars and destroyed by the collapse of the sky onto the earth. Name: 4-Wind. 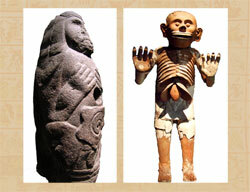 Ruled by Quetzalcóatl, inhabitants destroyed by hurricanes and turned into monkeys. Name: 4-Rain. 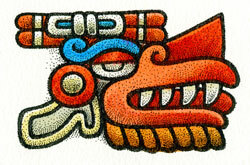 Ruled by Tlaloc (rain god), inhabitants destroyed by a rain of fire (volcanic eruptions) and turned into birds. Name: 4-Water. Ruled by Chalchiuhtlicue (goddess of water), inhabitants destroyed by floods and turned into fish. If you enlarge Picture 1 you can see clearly the sequence of the 4 previous ‘Suns’, in the 4 squares surrounding the deity in the middle. Each square has 4 large dots: each world’s name consisted of a number and a calendar sign. The sign for Wind is shown on its own in Picture 2. Can you see the name of the second Sun, ‘4-Wind’ in Picture 1? * Black painted body and face - he was the god of priests and the one who first performed ‘self-sacrifice’, by pricking parts of the body with cactus spines or animal bone needles to draw blood: can you see the bone sticking out of his headdress? From it flows a green snaky band ending in a turquoise disk - the symbol of ‘precious liquid’ or human blood. 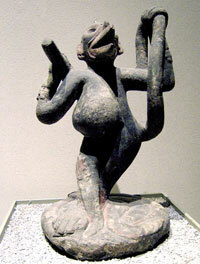 * Being a priest, he holds an incense burner with a handle shaped like a serpent (see the smoke coming from the top?) in one hand, and an incense bag in the other. * On his head is a CONE-SHAPED hat made of ocelot skin (like a jaguar’s). * His scarf, bracelets and ankle bands are also made of ocelot skin. The scarf is decorated with small shells that tinkle and rattle. 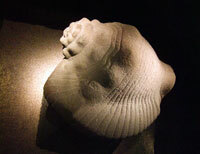 * His breastplate is a large sea shell, cut across the middle. * His earplug is a turquoise disk; from it hangs a red tassle and a piece of ‘TWISTED shell’. * His headdress holds black crow and red macaw feathers. First, the CONE shape. 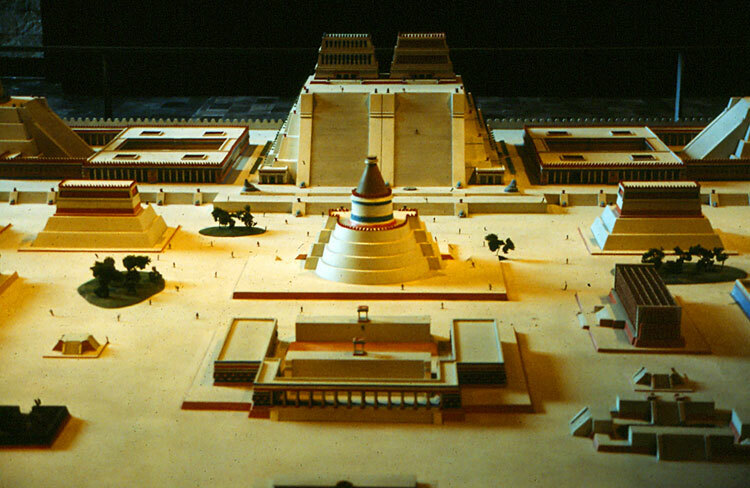 All temples dedicated to the Wind God were made perfectly round, and with a cone-shaped roof (spot his temple in the middle of the model of Tenochtitlan, PIcture 5). If you visit Mexico City today, take a ride on the city’s underground system (Metro - modelled on the snazzy Paris one) and stop off at the station called Pino Suarez. 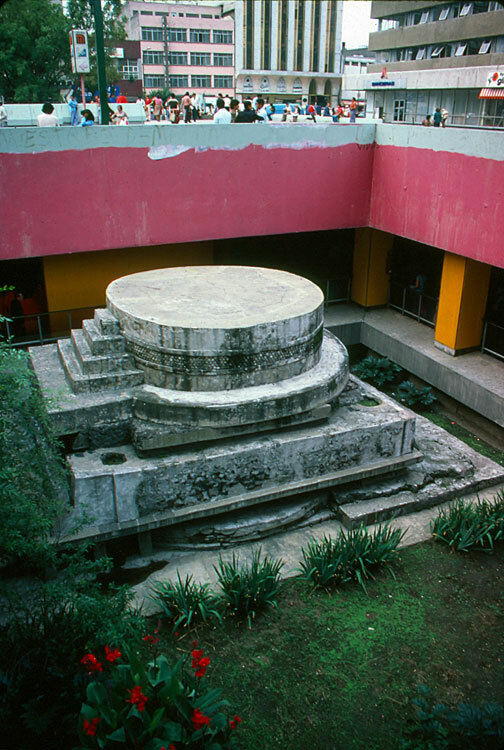 Bang in the middle of the station is the base of a round stone altar dedicated to Ehécatl. The altar was unearthed during construction of the station in 1967 where it remains to this day surrounded by the passageway between Lines 1 and 2. (Picture 6). Wow! Now, the TWISTED thing. This is just amazing... What shape is a super-fast wind, a tornado? In the USA they’re called ‘twisters’! 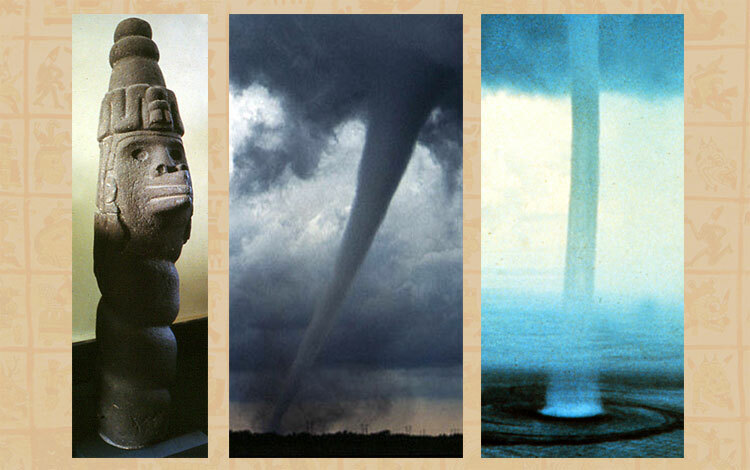 Compare the stone sculpture of Ehécatl, Aztec wind god, in Picture 7 - with its finely spiralled, rope-like ‘helix’ shape - with the two photos of twisters taken from Wikipedia. 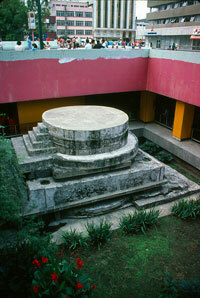 To show fierce wind as a concrete shape, the Aztecs went for this spiral effect - makes sense! Now, this is where you need to really use your imagination: the wind god blew the rain clouds in at the end of the dry season, forming strong whirlwinds that often announced the arrival of the rainy season (this is why Quetzalcóatl was also the god of agriculture for the Aztecs). 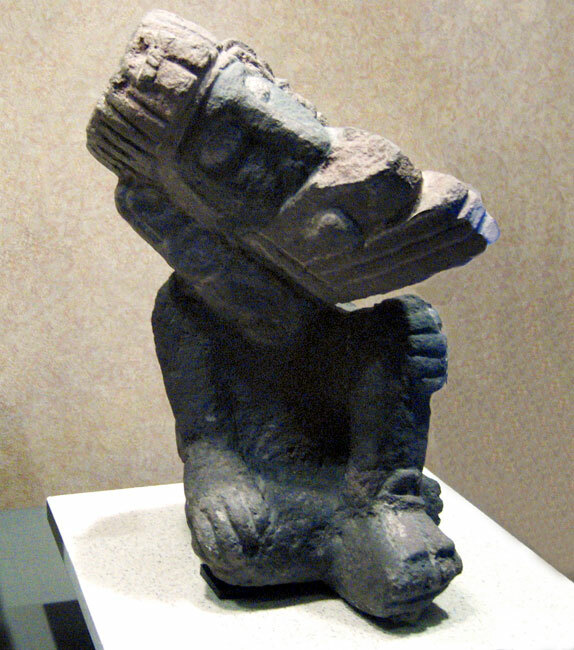 To represent this in sculpture, the Aztecs designed the figure of a pregnant monkey dancing on a coiled serpent (Picture 8); with its bird beak mask and twisting, spiralling body, this figure is very clearly Quetzalcóatl-Ehécatl. Where was it found? In the ‘circular pyramid’ at Pino Suarez Metro station! Try and picture this figure revolving at high speed: what an artistic way to represent a twister! When the Fifth Sun was created, it had no inhabitants. 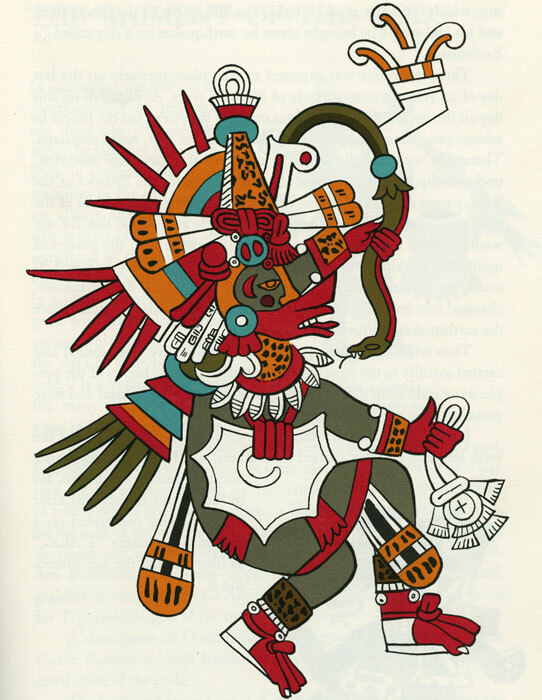 So the gods had a meeting and called on Quetzalcóatl-Ehécatl (let’s call him Q) to travel down to the underworld of Mictlan, to ask the Lord of the Underworld, Mictlantecuhtli, for the bones of the dead people from the fourth world. Not so simple: the double-dealing Mictlantecuhtli played a trick on Q. He gave Q a challenge that seemed easy - to travel around Mictlan four times while blowing a conch shell trumpet. Here came the trick: Mictlantecuhtli switched a proper playing conch for a plain one with no finger holes. Luckily Q realised he was being tricked and called on worms to eat through the shell to make holes and he called on bees to fly into the shell to make it roar with their buzzing. Mictlantecuhtli had no other choice but to give up the bones; even then, he plotted another trap for Q, who fell into a giant pit that the Lord of the Underworld had had made to block his escape. All the bones ended up broken and scattered. Eventually, though, Q managed to get away after carefully gathering up all the bones. Q was to take part in yet more challenges and adventures - finding a source of food for the first humans (read ‘The Story of Corn’, below) and creating the first maguey century plant cactus, that gives the fermented drink pulque. 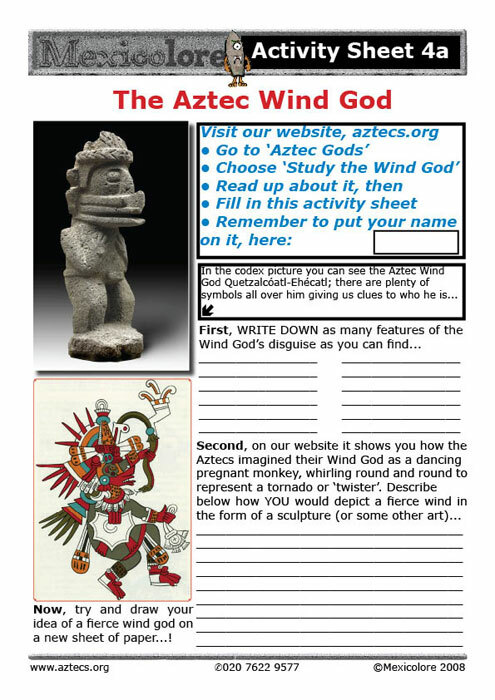 Now that you’ve learnt more about the Wind God, download the activity sheet on it (click on the PDF icon below) and get to work...! Q. 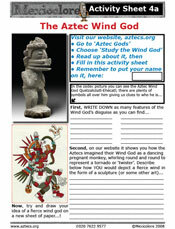 What effect does the Aztec wind god sculpture of a dancing monkey have on you? A. It just blows you away! 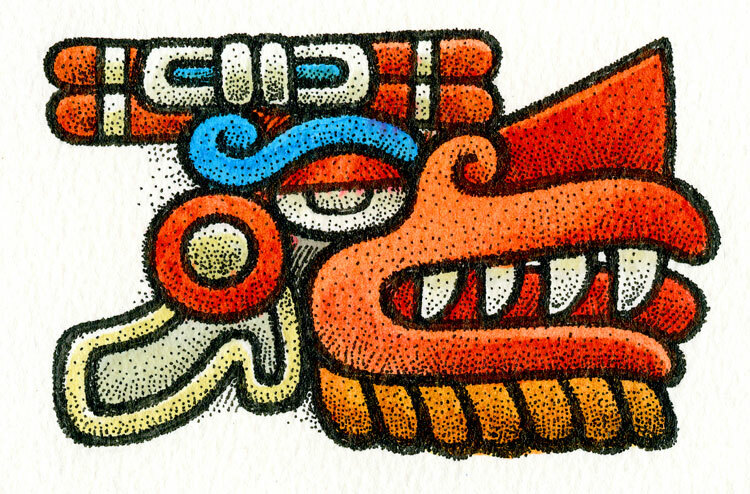 Quetzalcoatl also went by the name “Yahualli-Ehecatl” meaning “Spiral Wind.” Further connecting him to twisters and dust-devils. Yahualli also means ‘circular’ or ‘round,’ which explains why temples dedicated to Quetzalcoatl are designed in such fashion. New evidence presented by Carl de Borhegyi, son of Maya archaeologist Stephan F. de Borhegyi argues that the correlation of the Mayan Calendar, with the European Calendar may be off by 256 years, and contrary to much contemporary hype, the end of the fifth world ended in the year 1756, in other words, our world did not come to an end and the Mayan Calendar simply began a new cycle.